The new iJoy Avenger subohm tank may be pushing the envelope of borrowing fonts from a more famous Avenger franchise. 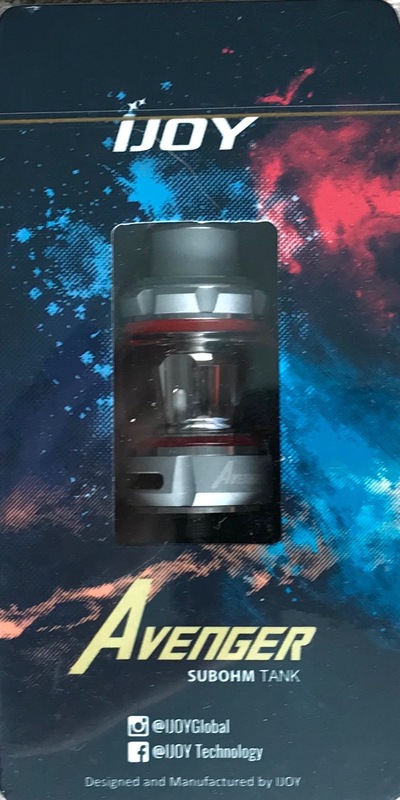 But, the real question might be “is the subohm tank the vaping hero we deserve?” Read the rest of the review to find out! On the surface, the Avenger tank seems fairly nondescript there is a bit of style touches, but otherwise it seems like standard fare. It’s a medium tank that doesn’t boast a lot of features like an unusual sliding top fill system. The tank isn’t designed to handle insane amounts of wattage. But, a boring specs page doesn’t necessarily make this a forgettable subohm tank. First of all, the styling does stand out. Featuring little angled bits and some nice finishes, the tank doesn’t look quite like the multitude of also-rans. When you couple the Avenger with the bulbous extra capacity glass tank and the wide bore drip tip, the tank stands out a little more. Interestingly, the coils also have a sort of angled style to them, though that seems to me a bit unnecessary. The coils within the replaceable heads use a vertical design with steel mesh and the tank comes with a .35 and a .15 ohm example of the heads. Despite the low resistance of the heads, the suggested wattage range for these heads do not exceed 90 watts. During my sampling of the tank, I found around 70 watts to provide the best balance of performance. If you’re used to ripping things at 100+ watts, you may think that the lower range of this tank is lacking. But, I think that’s where the strength of the iJoy subohmer comes shines through. The tank puts out a very nice vape even without pumping a ton of electricity through it. This translates into a pretty decent vaping experience that will help save on battery life. For a midrange tank, the iJoy Avenger is somewhat a juice hog. I find myself frequently refilling the tank more than it seems I should. This is especially true because I’m limited to the smaller of the two included glass tanks. Why am I limited to the small tank you may ask. The reason is that the bulb tank broke when it fell from the side of the sink into the sink in my bathroom. I assure you I don’t have a particularly unusual sink. A very mild fall broke the glass. It didn’t just make a small crack either. It shattered the tank to the point where it was difficult to take the tank apart and I had to pick bits of glass away from the frame and gasket before I could put the second tank in its place. I’m not sure if this is the result of just a weird fall at the wrong angle or if the bigger tank is more fragile. Quality otherwise seems to be decent. It’s not the most solid tank I’ve used. In particular the top cap you remove to refill the tank seems a bit thin and light. The heads on the other hand are quite well constructed. I was able to keep the same head going for several weeks and still get a clean vape. In short the Avenger isn’t the most powerful tank. It’s not the best looking and it isn’t the most solid device. It’s all around the middle of the road. Yet, the performance is better than expected. If you’re in the market for a decent tank, I think the iJoy Avenger subohm tank will fit the bill nicely.